Jenny Landreth spends time writing and researching about swimming for her books and The Swimming Blog in the Guardian. She recently authored Swell: A Waterbiography. 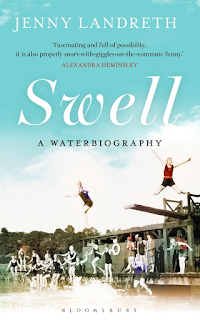 Bloomsbury Publishing describes Swell, "These days, swimming may seem like the most egalitarian of pastimes, open to anyone with a swimsuit – but this wasn't always the case. In the 19th century, swimming was exclusively the domain of men, and access to pools was a luxury limited by class. Women were (barely) allowed to swim in the sea, as long as no men were around, but even into the 20th century they could be arrested and fined if they dared dive into a lake. It wasn't until the 1930s that women were finally, and reluctantly, granted equal access. This is the story of the women who made that possible, a thank-you to the fearless 'swimming suffragettes' who took on the status quo, fought for equal access, and won. Part social history, part memoir, Swell uncovers a world of secret swimming in the face of these exclusions and shines a light on the 'swimming suffragettes'. It celebrates some amazing achievements, some ridiculous outfits and some fantastic swimmers who challenge the stereotypes of what women are capable of. It's also the story of how Jenny eventually came to be a keen swimmer herself. Swell is a joyful hymn to the sport and an exploration of why swimming attracts so many women. Ultimately, it is a book dedicated to our brilliant swimming foremothers who collectively made it possible for any woman to plunge in with alacrity, anywhere we choose." For more information on Swell: A Waterbiography, visit here.